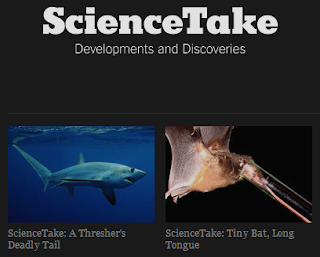 Science Take Videos is a series of 60 to 90 second videos hosted on the science page of the New York Times. These videos do quite a nice job of describing the qualities of animals that we, as humans, find fascinating. A small sampling of the Science Take Videos explaining these unique qualities include sharks, dolphins, spiders, and even bacteria. Science Take Videos can be a nice supplemental resource for your science curriculum. Science Take Videos is a small piece of the New York Times Science site both are definitely worth checking out. Big thanks to Richard Byrne and his blog Free Technology for Teachers for sharing this site.